A mysterious figure carries a bundle of fluorescent tubes. Why? The new film Big Eyes, which focuses on the dark secret behind a kitsch painting phenomenon of the 1950s, touches on the no-man’s-land between fine and popular art. There are artists whose work crosses over, embraced by both aesthetes and ordinary folks who just want something pretty to hang on the wall above the couch. Van Gogh and Monet, for instance, both seen as rebels in their day, are mainstream now, their masterpieces transcribed onto everything from dishtowels to shower curtains. But some critics hold that serious art has a responsibility to be edgy, to address weighty philosophical and social issues. 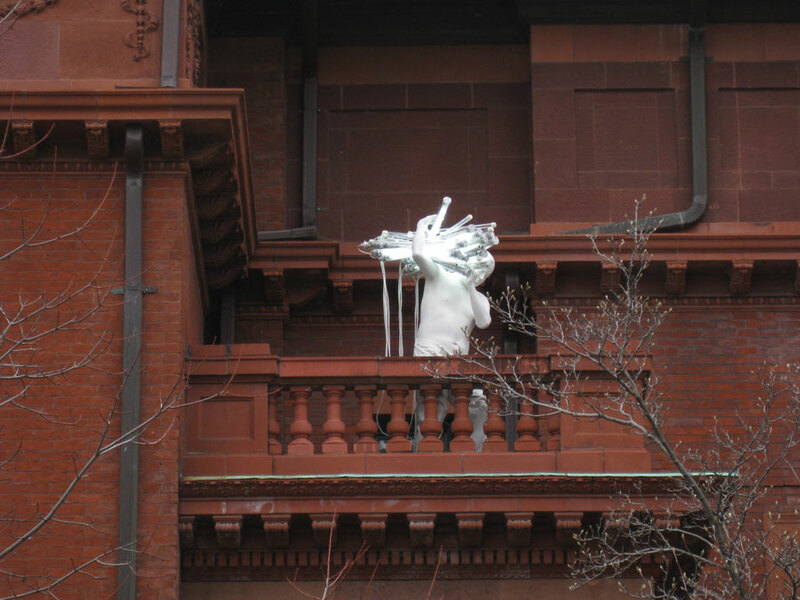 The sculptures of modern artist Bernardi Roig of Spain, for example, exemplify the kind of intellectually challenging work that draws museum interest. Roig’s “Man of Light” works, recently exhibited at The Phillips Collection, deal with “existential dualities of entrapment and liberation, blinding and illumination” among other things. Not everyone wants reminders of such issues hanging in their living rooms. Yet historically there have always been patrons of artists willing to produce images that support political or social agendas. Propaganda is a powerful tool for persuading voters, as well as moviegoers. An image worth a million words sometimes trumps the finest policy speech. Of course when it comes to art, everyone’s a critic. We know what we like. And we know what we don’t. Millions of people love the paintings of Margaret Keane, whose big-eyed images sold like hotcakes in the fifties, and no doubt will see a boost in sales from the new film. Yet Keane’s work was dismissed by most serious art critics from the start of her career until much later, after the truth came out that the artist had been swindled by her first husband, who for years took credit for her paintings and got rich and famous pretending they were his. Since then the big-eyed paintings have been reevaluated in the context of the continuing struggle for women’s rights. The power of art to speak to power, to challenge power, has been dramatically apparent this past week. The murders in Paris of more than a dozen people, many of them comic artists, underscores the relevance of art in our world. By committing their crime in the City of Light, the epicenter of Art in the civilized world, the perpetrators of this latest affront to freedom and peace have raised the stakes in our terrorist-plagued time. And judging by the passionate response in Paris and the entire world, perhaps there is hope that humanity will finally find the political will to unite against this common threat. Too often in the dialogue of nations communications stall due to failures of language. Mistrust and confusion fester in bad translation. Art transcends the barriers of written and spoken language. Sometimes the message is simple and poignant. Big eyed children gaze at us not only in kitschy paintings but in sharp photographs of ongoing famine situations. The sight of one can summon the emotional response of the other. It’s understandable that religious extremists see nothing humorous in comics that mock their views. They’re free to be offended if they can’t take a joke. But in the recent case, by committing murder in the name of whatever they think is holy, they have drawn far more attention to comic art, thus increasing its impact. Sure, some comics are cute. Some are silly. But artful humor has a role in the fight against the dark side. And never underestimate the art of wrath. In a war of wits the winner has the last laugh.